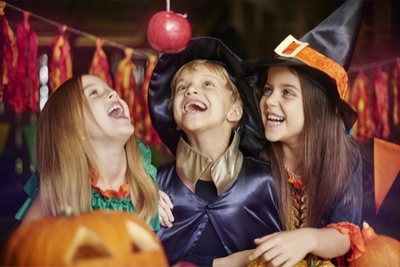 Looking for fun kids Halloween games? Here you’ll find a variety of games that are appropriate for a classroom party, or for a party at home! Whichever game you pick, the kids will be sure to have a hauntingly good time! Do you have some games that didn't make our list? We'd all love to hear about them! Together we can help create a large resource of kids games! 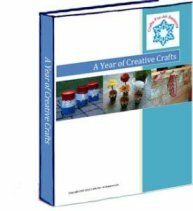 There is place at the end of the page to submit your idea. Many thanks! Click to open the PDF file of a Halloween Word Search. You may print and copy as many of the word searches as you need. Pass this out to all the kids along with a pencil. Have all the children begin at the same time. The person that gets done first is the winner! Or, play this game as a quiet activity for kids to do at their desks. 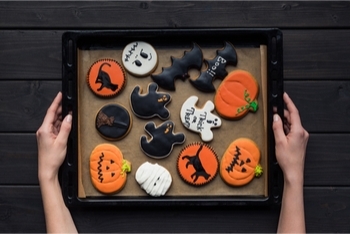 For this kids Halloween game, an adult comes out with a tray full of Halloween items. They show it to the students for 1 minute, instructing each child to study the items carefully. The adult leaves the room with the tray and the children are asked to write down as many items as they can remember from the tray. Tips: This game works best with 12 to 15 items. Be sure they are large enough to be seen. You could also play the items on a table in the front of the room, and then cover it with a cloth when the game begins. Basically, any type of Halloween decoration that is the right size for the table or tray can be used for this game. The student who remembered the most items wins! For this game, kids divide into two teams and form a single file line. They race up to a table or chair, which has a Halloween bucket or bag full of sucker ghosts (suckers covered with a tissue and tied with a ribbon to resemble a ghost). Attached to the stem of each ghost sucker should be a tag of paper with an action written on it, such as hopping, walking backwards, dancing, moonwalk, etc. The child must perform the action while returning to the front of the line, where the next child takes their turn. This game is race, so the students must move quickly! Be sure to have the same actions for both teams somewhere in the bucket, to make it fair. This is fun kids Halloween game that children really seem to like! 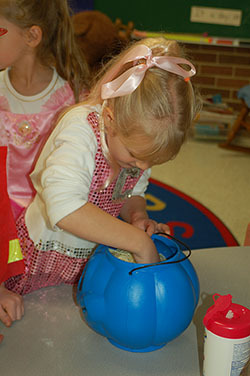 Each child gets the opportunity to find two or three small Halloween treasures within an icky, gooey, squishy pumpkin! Here’s how to set it up: In a plastic trick or treat pumpkin (or use a pail or bowl), add cooked spaghetti noodles (no sauce, but you can add a bit of vegetable oil to make it extra slimy). To the cooked spaghetti, add small little Halloween items, such as small rubber mice, little rubber eyeballs, etc. Each child gets to take a turn sifting their hands through the “pumpkin brains” to find two or three treasures each, and then the next student gets a turn. Tip: It works best to have three to four pumpkins set up to keep this game moving. Have plenty of hand wipes ready for the children after their turn, and cover the table with newspapers. This game can get a bit messy! Have the children line in single file, into two teams. Give each child their own plastic spoon. Fill a pumpkin bucket full of candy corn and have it on a chair or table at the front of the line. The child must scoop up some candy corn in their spoon, place the handle of the spoon in their mouth, and hold it using their teeth. They must walk with the spoon in their mouth to another table or chair some distance away, which holds a small glass jar. Once they arrive there, they may take the spoon out of their mouth and dispense the candy corn into the jar. They must walk carefully or candy corn will spill out, and it is not allowed to be picked back up! Each child runs back to the next person in line and then the next child tries. The team to fill the small jar up to the top with candy corn wins! This game is so entertaining to watch, but it is best for a home party, and not the classroom, due to the set up involved. You will need several apples. Each apple needs to be threaded with some strong cotton string. This can be done by threading the string through a large needle, and piercing the needle through the middle of the apple. Or, you can tie the string tightly around the stem if you are able. Tie a clothesline across the room, and hang the apples from it. Keep them at varying lengths, since some of your guests may be tall, and some may be short. 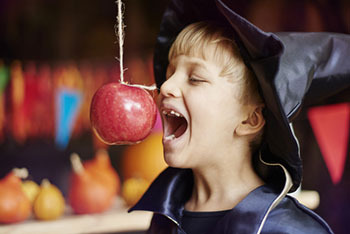 The goal of the game is to see if guests can take a bite out of one of the apples while keeping their hands behind their back. You’re your video camera running, since this is so funny to watch! This game is also great for a home party, especially if it takes place in the evening and you can hide clues outside in the yard. Write out clues on small pieces of paper, and wrap and tape them around the stems of a sucker ghost (as explained in the ghost sucker relay above). Hide the ghosts behind things in the yard. Examples: Under a rock, by the garden hose, in the potted plant on the deck, behind the tombstone in the front yard, etc. Each clue should give an idea or where the next ghost is hiding! The end can lead to a prize or a bowl of treats for all to enjoy!